The year started with my blog really starting to take off, which was such a joy after several months of seemingly writing to no one! Although the numbers have been slow and steady (especially since but we'll get onto that), it's been such a delight to see new comments from you all and new readers following my blog. I got to work with some great brands this year, such as KEEN Nutrition, Dove (! ), Beyond The Kale (a local healthy eatery), and writing for Yumbles too. There were also a good handful of other lovely bloggers who shared some fab posts on SSL which its of you really enjoyed too, and I even shared some words of wisdom on their blogs too. 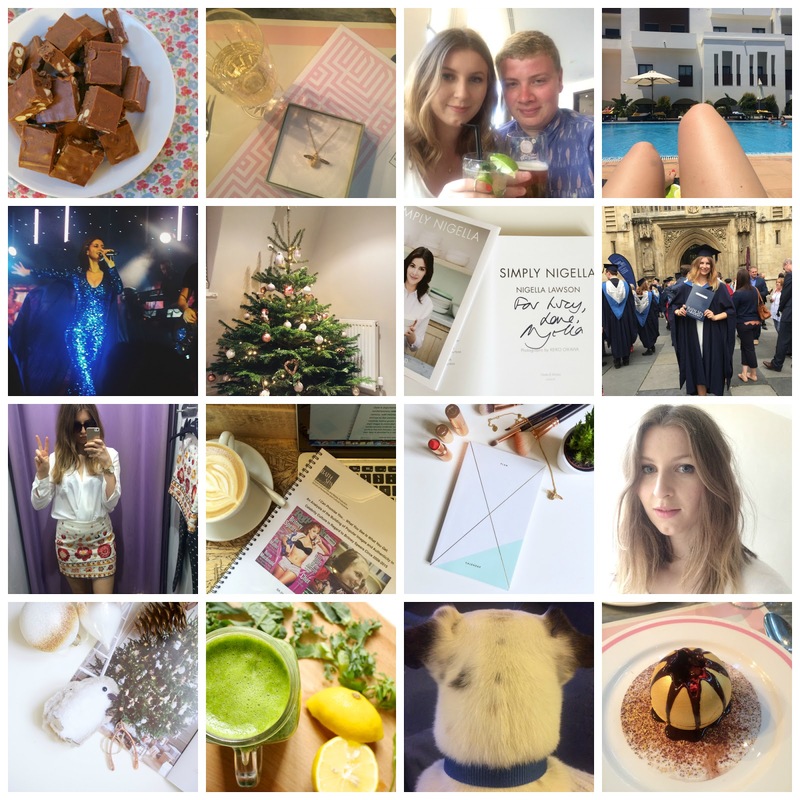 I feel I've also learned so much from blogging and social media this year, which I really hope I can carry through and build on in 2016 and even on other ventures too (...!). My content has grown, writing has developed and I'm really quite liking my photography, but all of these things I can only hope will grow even better in the New Year. SSL was also part of my degree (more on that in just a second) and I even achieved a First for the module it was part of which was such a huge surge of confidence that I really need to remind myself of when I'm feeling a bit down about it all. Another epic thing that happened was that I turned 21! How did that happen, just the other day I was at my 4th birthday party! I celebrated with some of my lovely friends, my family, Patrick my dog and James of course. There was a lot of fine dining, champagne and special gifts too. Perfect. The biggest moment of this year was when I graduated with a ridiculously high 2.1 (or an 'Upper 2.1' as I like to refer to it as - milking it for all it's worth, eh), which was something I really never believed would happen. The first six months of this year were so stressful with millions of deadlines all happening at once, and progressing at work, and writing on here too. It was tough but I did it, and I still feel so proud of myself. I was in such a bad place in my life when I first moved to University, and was desperate to leave after a matter of months but I persevered (thanks to my Mum's encouragement!) and here I am. Yippee! Oh, and writing my dissertation on my Queen, Britney Spears, was the moment I felt like my life had been leading up to, and is 158% the best thing I've ever written. No lie. June saw James and I move into our first flat together which was madness and expensive but it feels great to have our fab little flat in Bath together. There's still a few more things we need to do (I still have 50% of my clothes in a suitcase under my bed! ), and a few more home-y touches are needed here and there but otherwise, I love it! I hope to share a bit more of my home with you in 2016, but the only negative thing about our flat is that natural lighting is only ever available when I'm at work which is fantastic. But when there's a will, there's a way! Music has been a huge part of 2015, in particular seeing Years & Years live, and also my second Queen, Marina and The Diamonds live too (squee!). I still cannot get over the fact I was within feet of her and we even had eye contact. Lame, sad, pop freak freakout moment over! 2015 will also be known as the year of Carly Rae Jepsen in my music library, and for that, I am eternally grateful. I seriously believe my main happy moment of this year was right in the middle, what with graduating and moving into a new home, and that's absolutely fine. But as I'm sure you're aware, I'm all for balanced living and I feel when there are great moments, there does have to be some not so great moments. The six months following weren't always the best, I haven't been feeling 100% me all of these six months unfortunately. I'm working on it, but I think post-grad 'blues' and general life woes have been getting me down, hence why I also feel my blog has taken a bit of a back seat. Since going full time at work I've struggled to find time and energy to sit down and get organised but that's something I'm 100% confident is going to change in 2015! In December, my Grandma unfortunately died which was only a few weeks ago and has still left a bit of a dark cloud above me. It was however a complete blessing in disguise, I suppose as I feel it's made me totally re-evaluate my life and situation and I feel it's my Grandma pushing me to really live my life and be happier. Life's too short to live an unhappy life! So, it's been a mixed bag but those highs have been seriously good highs that I will forever cherish. 2016 is going to be good, I just know it. I know everyone says not to be too ambitious with resolutions or New Year plans but what's the point in setting goals if you can't set them high?! I'll be back here tomorrow and hope to see you again then, but for now, Happy New Year. Thank you ever so much for all your support and kind words in 2015, it has meant so much and cheered me up at the worst of times! Here's to a fab New Year! How has your 2015 been? What have been your highlights? Do you have any New Year's Eve plans?